I served as Vicar for Priests in the Diocese of Phoenix from November 2006 until my ordination and installation as the 4th Bishop of the Diocese of Gallup on April 23, 2009. The position of Vicar for Priests required that I work full time with the priests in the Diocese of Phoenix, primarily working with priests personnel and ongoing formation for the priests. During this time I was able to assist by offering Mass and hearing confessions in a number of parishes throughout the Phoenix metropolitan area. One of my favorite places to assist was the Missionaries of Charity shelter which was attached to Our Lady of Fatima Parish in inner city Phoenix. Every Tuesday and Friday morning at 7 am I was able to offer Mass for the sisters, volunteers and residents. This gave me in insight into the spirituality of the Missionaries of Charity, as well as the missionary spirit they had as they served the poorest of the poor. You can imagine my delight when I found out there were a number of Missionaries of Charity serving in the Diocese of Gallup. Prior to my arrival in the Diocese of Gallup, one of the Missionaries of Charity said to me “you can never get rid of the Missionaries of Charity, we are everywhere”. Thank God! Their presence, serving the poor throughout the world, is a testament to the original calling Mother Teresa received from our Lord in 1950 when she founded the Missionaries of Charity: a call to quench the thirst of the Crucified Christ in the poor. Charity is a two-fold grace. Its primary effect is of moving the will to love God fervently above all things, with the secondary effect of intensifying love for our neighbor. It is a fulfillment of God’s commandment “You shall love the Lord, your God, with all your heart, with all your soul, and with all your mind…You shall love your neighbor as yourself” (Matthew 22:37,39). Saint Teresa lived the virtues – Theological and Cardinal – for the world to see. She did this not to be “showy”, but as a beautiful witness of her Catholic faith, a beautiful expression of her love for Jesus Christ and His Church. Primary among the virtues she practiced was the virtue of humility. If she were prideful, which is the opposite of humility, then her actions would have been in vain, but because she was humble – serving the poor out of a genuine sense of love for God and neighbor – her actions were animated by the power and strength of the Holy Spirit. Remember, if we are prideful, then there is no room for God or others in our lives. However, if we foster the virtue of humility, emptying ourselves of all pride and vanity, then we make the perfect resting place for the Spirit of the Lord. When St. Bernard of Clairvaux was asked to identify the three most import virtues toward growth in the spiritual life, he replied “humility, humility, humility”. We must never underestimate the necessity of humility in our lives. The humility of Saint Teresa of Calcutta allowed her to be an icon to the world of the virtue of Charity – especially in her love for the poorest of the poor – and to be a voice for the voiceless, a champion of the unborn. She was very courageous in the face of much adversity. She lived in a world, as we do today, that does not give value to fostering of virtue, a world which at times even chooses to make up its own “virtues”. We are all products of the “me generation”, whether we like it or not. Central to the spirit of the “me generation” is the question “what’s in it for me”? A question such as this leads one to think of oneself first all the time. This way of thinking is not new or distinctive only to the present age, as it goes back to the creation of man. When Adam and Eve sinned in the Garden of Eden they essentially said “I don’t care about God or anyone else”. Their actions said “I want what I want now and I don’t care about anybody else but me”. This was selfish then and it continues to be selfish today as many people live by this self-centered way of thinking. Saint Teresa was not one of these people. She lived for God and for others. She was “counter cultural”. She was a light of love in world enveloped in darkness, a darkness that turns a blind eye to our brothers and sisters, especially the poor and marginalized. To give into the spirit of the age is to lack love, which Saint Paul tells is the most important of all virtues. “So faith, hope and love remain, these three; but the greatest of these is love” (1 Cor 13:13). If we were to give into the spirit of the age, then we would forget about God and our neighbor, causing us to give into a disorder: love of self. Our Lord said “if anyone comes to me without hating his father and mother, wife and children, brothers and sisters, and even his own life, he cannot be my disciple” (Luke 14:26). We know Jesus is not asking us to literally hate our neighbor, rather he is asking us, as the Rule of Saint Benedict teaches, to “prefer nothing to the love of Christ”. If we prefer others or ourselves above the love of Christ, this would produce a life that is not properly ordered. This is the spirit of the age, and Saint Teresa of Calcutta lived a life contrary to this. You might even say she was “counter cultural”. While the world was saying “love yourself” or “what’s in it for me?” she was promoting the virtue of love – love of God and neighbor. 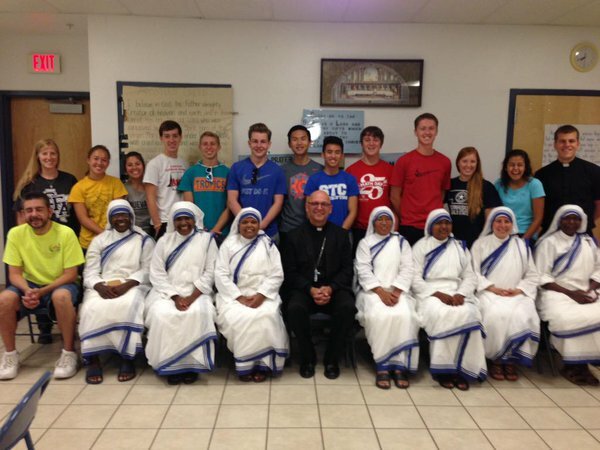 Bishop Wall with a youth group from Lincoln, Nebraska and the Missionaries of Charity in Gallup. At times the world attempts to manufacture its own virtues. One such worldly virtue is “tolerance”. The spirit of the age promotes a tolerance for all sorts of actions, even if they are sinful. Jesus never tolerated sin, nor should we. The modern age tolerates, and even promotes, the sin of abortion. Abortion is killing of an innocent, defenseless human life in the womb. Saint Teresa of Calcutta did not tolerate the sin of abortion and spoke out courageously against this assault on human life. In 1994, at the National Prayer Breakfast in Washington, D.C., she gave strong defense of the Church’s teaching on the sanctity and dignity of human life. In the audience there were those who agreed with her, as well as those who strongly disagreed with her and the Church’s teaching on the gift of life. We must never tolerate sin. We must love, even when it hurts. Our Lord showed us the the perfect act of love on the cross, and Saint Teresa imitated His love through her selfless service to those who were in need, especially the poorest of the poor. This love is one that calls us to be in solidarity with our brothers and sisters in need, those born and unborn, those hungry and living on the streets, those in prison, those strangers to our land. To love is to will the good of our neighbor. To say “I love my neighbor”, but to tolerate his or her sin, is a false love. To say “I love my neighbor” and to turn a blind eye to their pain is not a true love. Rather, love calls us to go beyond our comfort zone, to be self-sacrificing for the good of our neighbor. Saint Teresa and her Missionaries of Charity showed – and continue to show us – this love, to put a face on the love of Christ, especially to the poorest of the poor. Previous ArticleNM Bishops: Governor's Advocation of Death Penalty is "Irresponsible"